1Division of Cardiology, University Hospital Rangueil Toulouse France .2Boston Scientific, France. While ablation of accessory pathways is usually performed without 3D mapping system, we present a case where high-density mapping helps in illustrating the anatomical features of epicardial and oblique AP connections. 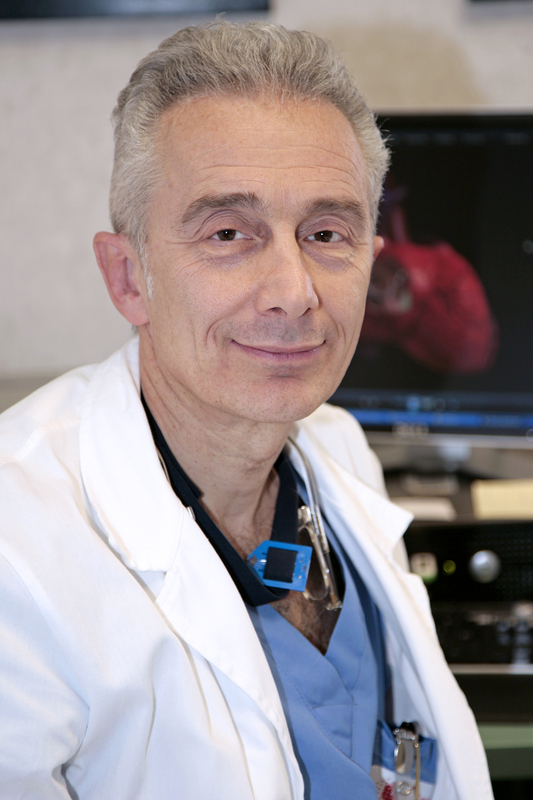 Key Words : Wolff-Parkinson-White, High-Density Mapping, Radio-Frequency Ablation, Accessory Pathway. Ablation of accessory pathways (AP) is currently performed with conventional mapping based on a well-accepted set of criteria, eliminating the need for 3D mapping systems in most cases, because of the excellent immediate and long-term results using these simple parameters in trained hands . The Rhythmia system ™ (Boston Scientific, Inc.) is a useful mapping tool for achieving very detailed atrial or ventricular activation with high resolution . High-density mapping may be especially helpful in revealing particular features of wave propagation. We report about a mapping case of an epicardial accessory pathway using the Rhythmia system ™, highlighting some specific features of how some accessory pathway may link atrium and ventricle. A 28 years-old man with a left posterior WPW and both antidromic and orthodromic reciprocating tachycardia was referred for ablation. A first procedure had been performed some weeks before, but pre-excitation recurred late after acute success of radio-frequency (RF) ablation into the proximal coronary sinus (CS). After both retrograde aortic access and trans-septal puncture, electro-anatomical maps of the left atrium, CS and left ventricle were created using the Rhythmia system ™ with the Orion catheter, which is a mini-basket catheter made of eight splines with eight 0.4 mm2 electrodes each (64 electrodes, 2.5 mm spacing). 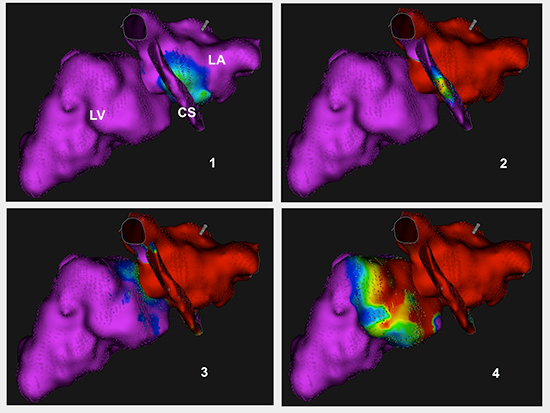 Activation maps at the left atrium, CS and left ventricle were built during pacing at the distal CS. Timings of activation were manually reannotated against the same reference (pacing artifact) in each chamber for allowing vizualisation of complete atrio-ventricular propagation into a single map. Analysis of propagation showed first a focal activation from the low lateral left atrium facing the distal CS where pacing was delivered, concentrically invading the whole left atrium from bottom to summit. Then, after a 100 ms delay, epicardial ventricular activation emerged as recorded into the external part of the postero-lateral CS, facing the site of earliest atrial activation. Then basal and more superior/medial left ventricular endocardium was depolarized 35 ms later (see Figure 1 to Figure 3). This was considered as a sign of an “epicardial” accessory pathway, connecting both left atrium and ventricle through muscular extensions of the CS coat . There was no CS diverticulum or aneurism. Figure 1. Left atrial, CS and left ventricular activation maps during distal CS pacing. Purple: non depolarized tissues. Green-Blue: onset of activation. Red: depolarized tissues. Activation proceeds from endocardial low lateral left atrium (1) to external CS (2) then to more medial basal endocardial left ventricle (3) before spreading to the whole cavity (4). Figure 3. Intracardiac bipolar and unipolar recordings at the same sites as fig 1. Local activation is shown by arrows. 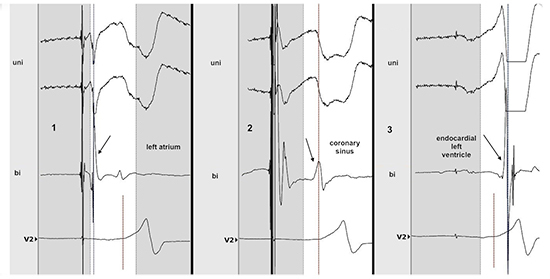 Note the precession of ventricular activation at the CS compared to the endocardial ventricular recording, and the QS pattern at the CS in unipolar recording while there was an R wave at the endocardial left ventricle. Ventricular activation at the CS happens 35 ms before the ventricular endocardial one (see text). Vertical dashed line represents the timing of delta wave onset on surface ECG. RF ablation (25 W irrigated) was performed into the CS - near the middle cardiac vein opening - at a site showing QS pattern in unipolar recording and with local depolarization preceding the delta wave by 25 msec, without visible AP potential (Figure 4). Criteria were not better at the endocardial aspect of the mitral annulus. RF application was successful, but multiple RF attempts were needed at this site because of delayed recovery of pre-excitation after 15 to 30 minutes observation in two instances, before anterograde and retrograde conduction over the AP could be finally definitively eliminated. The patient did not present with recurring tachycardia nor pre-excitation over a follow-up of 2 years. Figure 4. 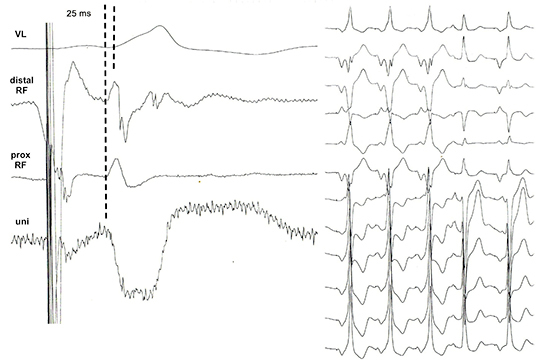 Bipolar and unipolar electrograms at the site of successful ablation (left) and disappearance of pre-excitation during RF (right). Local ventricular depolarization at the CS preceeded the onset of delta wave by 25 ms.
AP ablated into the CS are expected to link both left atrium and ventricle through fibers of the CS musculature connecting left atrial myocardium to remote left ventricular epicardium . While direct electro-physiological proofs for this assumption are exceptional , this case may serve as an illustration of this hypothesis. The oblique direction of most AP have been demonstrated using electro-physiological techniques. Posterior left AP endocardially ablated at the AV groove usually have medial ventricular insertions and lateral atrial insertions . Although location of atrial insertion was not determined here, “epicardial AP” through CS coat may also lead to lateral to medial pattern of activation . The Rhythmia system ™ allows to well illustrate both paradigms in this case. The propagation demonstrated the oblique course of the left AP and its “epicardial” location, since activation of the external part of the CS – i.e. far-fields of the epicardial aspect of the left ventricle - was shown to follow atrial endocardial activation and to precede the ventricular endocardial one, with delays between both endocardial activations compatible with propagation along external structures. Although simple conduction disturbances into a trivial AP can not be ruled out, the lack of any detectable activation during around 135 ms between onset of local atrial activation and earliest endocardial ventricular depolarization is more compatible with an AP not directly connecting both atrial and ventricular endocardium, where continuous potentials between A and V are usually seen  and where CS is delayed. Although ablation of AP is better performed without 3D mapping system in most cases, because of easy, rapid, cost-effective and almost always successful procedures with acceptable low fluoroscopic exposure in trained hand , high-density mapping in this example helps in illustrating the anatomical features of AP connections. S Ernst, FOuyang, MAntz, RCappato, KHKuck. Cardiac electrophysiology. From cell to bedside. Catheter ablation of atrioventricular reentry. Philadelphia: Saunders:. 2004;0:1078–0. Anter Elad, McElderryThomas H, Contreras-ValdesFernando M, LiJianqing, TungPatricia, LeshemEran, HaffajeeCharles I, NakagawaHiroshi, JosephsonMark E. Evaluation of a novel high-resolution mapping technology for ablation of recurrent scar-related atrial tachycardias. Heart Rhythm. 2016;13 (10):2048–55. Sun Yingxian, ArrudaMauricio, OtomoKenichiro, BeckmanKaren, NakagawaHiroshi, CalameJames, PoSunny, SpectorPeter, LustgartenDaniel, HerringLisa, LazzaraRalph, JackmanWarren. Coronary sinus-ventricular accessory connections producing posteroseptal and left posterior accessory pathways: incidence and electrophysiological identification. Circulation. 2002;106 (11):1362–7. Cipoletta Laura, AcostaJuan, MontLluis, BerruezoAntonio. Posterior coronary vein as the substrate for an epicardial accessory pathway. Indian Pacing Electrophysiol J. 2013;13 (4):142–7. Otomo K, GonzalezM D, BeckmanK J, NakagawaH, BeckerA E, ShahN, MatsudairaK, WangZ, LazzaraR, JackmanW M. Reversing the direction of paced ventricular and atrial wavefronts reveals an oblique course in accessory AV pathways and improves localization for catheter ablation. Circulation. 2001;104 (5):550–6.